We’d love your help. Let us know what’s wrong with this preview of The House of Mitford by Jonathan Guinness. The classic story of one of the twentieth century's most extraordinary families. Among the six daughters and one son born to David, second Lord Redesdale, and his wife Sydney were Nancy, the novelist and historian; Diana, who married fascist leader Sir Oswald Mosley; Unity, friend of Hitler; Jessica, who became a communist and then an investigative journalist; and Deborah, The classic story of one of the twentieth century's most extraordinary families. Among the six daughters and one son born to David, second Lord Redesdale, and his wife Sydney were Nancy, the novelist and historian; Diana, who married fascist leader Sir Oswald Mosley; Unity, friend of Hitler; Jessica, who became a communist and then an investigative journalist; and Deborah, Duchess of Devonshire and mistress of Chatsworth. To ask other readers questions about The House of Mitford, please sign up. I willed myself on through this book, reading closely for bits I didn't know, but it was uphill work. The writing was terrible: horrible style, lack of organization, lousy paragraph structure, pathetic transitions, repeated cliches, clumsy phrasing, etc., etc. The heavy-handed attempts to put Diana in a good light also grated after a while. Lovell's book is much better. Despite my interest in the subject, I barely got through this. Must add that the Guinnesses (those who wrote this) don't sound v I willed myself on through this book, reading closely for bits I didn't know, but it was uphill work. The writing was terrible: horrible style, lack of organization, lousy paragraph structure, pathetic transitions, repeated cliches, clumsy phrasing, etc., etc. The heavy-handed attempts to put Diana in a good light also grated after a while. Lovell's book is much better. Despite my interest in the subject, I barely got through this. Since reading Nancy Mitford's "The Pursuit of Love" and Decca Mitford's "Hons and Rebels", I've been fascinated with Mitford sisters. Born into a family of old-fashioned, deeply traditional British landed gentry amidst the upheavals of the 20th century, the sisters developed along wildly different paths. Nancy became a pleasure-loving, bohemian "Bright Young Thing" and eventually an author; Decca became a Communist, running off to help the Spanish Republic and eventually working as leftist journ Since reading Nancy Mitford's "The Pursuit of Love" and Decca Mitford's "Hons and Rebels", I've been fascinated with Mitford sisters. Born into a family of old-fashioned, deeply traditional British landed gentry amidst the upheavals of the 20th century, the sisters developed along wildly different paths. Nancy became a pleasure-loving, bohemian "Bright Young Thing" and eventually an author; Decca became a Communist, running off to help the Spanish Republic and eventually working as leftist journalist in America; Diana joined the British Fascist party and married its leader; Unity became a Nazi and friend of Hitler. But Nancy and Decca's books treat all these developments as primarily piquant and amusing, skimmingly lightly across the surface of even the most extreme clashes of individuals and ideologies. I had hoped that Jonathan Guinness' group memoir of the sisters would serve up more insight into the dynamics of a family whose conflicts so dramatically echoed those that were taking place on the world stage. I'm a bit obsessed with the Mitfords but this book was boring. It suffers from the fact that the author is a nephew of the sisters but he is also not a very good writer. About 1/2 way through and starting to skip around a bit...it's a big book and I'm finding some of the sisters more interesting than others, but overall what a fascinating family. After this sitting considerably far down my Mitford history reading list, I was taken by its erudition. My expectations were cynical, knowing it was penned by family insiders: author Jonathon Guinness, 3rd Baron Moyne, is the eldest son of Diana Mitford Mosley by her first husband Bryan Guinness; his co-author is his daughter the Hon. Catherine Guinness. My tainted expectations could not have been wider off the mark. Not only is there a marked absence of family bias, but the wordsmithing outshine After this sitting considerably far down my Mitford history reading list, I was taken by its erudition. My expectations were cynical, knowing it was penned by family insiders: author Jonathon Guinness, 3rd Baron Moyne, is the eldest son of Diana Mitford Mosley by her first husband Bryan Guinness; his co-author is his daughter the Hon. Catherine Guinness. My tainted expectations could not have been wider off the mark. Not only is there a marked absence of family bias, but the wordsmithing outshines every Mitford biography I have read. He does his forebears proud, his craftsmanship a testament to this clever bloodline. His being schooled at Eton and Oxford, one might expect this standard, but others with similar academic foundations have produced less impressive works. I did not find, as certain readers have implied, any pro-Conservative slant to the narrative (the author was a Conservative Party Parliamentary Candidate). Wary of rightwing undertones, I here found objectivity from start to finish. Graced with impartiality, the content may stop short of censuring history's political right, which is not tantamount to partisanship. After leaving her first husband for British Union of Fascists leader Sir Oswald Mosley, Diana spent time in Germany with Hitler and his inner-circle in the prelude to WWII, aiming for a Nazi-approved radio station for the BUF which never eventuated. When Mosely was imprisoned early in the war under 18B as a potentially dangerous person, Diana was initially left to do much of his bidding on the outside. Nancy was summoned by MI5 to comment on how 'dangerous' she thought her younger sister. Putting patriotic duty before blood, Nancy said she thought Diana 'highly dangerous', swaying the government's decision to lock up Diana too. Separated from her babies, Diana was accordingly detained without charge or trial for years, subject to the horrors of Holloway Jail. Diana never learned of this sisterly betrayal until late in life and Mosley never learned of it. So, one could understand any tinge of injustice felt on his mother's behalf by this author, who as a youngster witnessed her long imprisonment. Yet this is barely evident, if only hinted at (how much of the text his co-author daughter Catherine contributed is unclear). The telling of Mosley's career itself is presented minus the fascist-bashing righteousness of many, from a rational 'setting-the-record-straight' standpoint. That seems fair considering the author is Mosley's stepson. It carries no hint of the fascist apologist we might anticipate. I confess to being least taken by the convoluted earlier histories and lineages of the Mitford sisters' two grandfathers, Algernon Freeman-Mitford ('Barty') and Thomas Gibson-Bowles, as I always am. Even so these are more impeccably detailed than any other Mitford historian's efforts I've encountered. To call this author's archival prowess masterly is a gross understatement. This book, Mitford descendants can keep in stately libraries and others can consult through the mists of time. I wish I had read this particular Mitford history sooner as it surpasses all others. With Jonathon Guinness in his late eighties as I write this review of a book published thirty-four years ago, there still feels to be some carryover from these remarkable sisters, all now long dead. Since reading Mary Lovell’s book on the Mitford sisters, I have been intrigued by the family. This book gave an in-depth exploration but was tediously detailed. I ended up reading other books around this as I found it a slog to get through. As I suggest, it is informative just not particularly engaging or entertaining. I was drawn to the Mitfords through reading Madame de Pompadour by Nancy Mitford, and this book does give a lot of detail. It's just that it is rather difficult to read, a bit of a slog, and it isn't well organised. As a shameless Mitford fan, naturally I enjoyed this book. Written by the son and granddaughter of Diana Mitford Mosely, it is naturally a defense of the House of Mitford, and for the most part comes across as a reasonable one. The portraits painted of the family are more intimate than those in other books. It gets beyond the caricatures and describes actual three-dimensional people, family dynamics and the historical context that explains much which might otherwise seem inexplicable I especiall As a shameless Mitford fan, naturally I enjoyed this book. Written by the son and granddaughter of Diana Mitford Mosely, it is naturally a defense of the House of Mitford, and for the most part comes across as a reasonable one. The portraits painted of the family are more intimate than those in other books. It gets beyond the caricatures and describes actual three-dimensional people, family dynamics and the historical context that explains much which might otherwise seem inexplicable I especially appreciated the portraits of the very interesting grandfathers Mitford and Bowles who led quite remarkable lives. I only wish that Jonathan had written a little more on a personal level about Diana and how she managed her role as mother and stepmother through a scandalous divorce and remarriage, and later from prison. Ultimately, the thing I love the best about the Mitfords and the reason I love them at all, is their sense of humour. It is their wit more than anything that is indelible. Written shortly after the death of Mosley, it is in part an exploration of (if not an apologia for) Diana's involvement in his movement, written very skilfully by her descendants. But it has many worthwhile aspects, including the information on the Mitford grandfathers, Bertie Redesdale and Tommy (or Tap) Bowles. I would love it if Sadie's unpublished manuscript, referred to in the book, were available for readers. Downton Abbey on Acid: Non-Fiction history of impoversihed British aritocratic family well known for being super wacky, eccentrics. This book follows their lineage to see how the family turned out so wack. 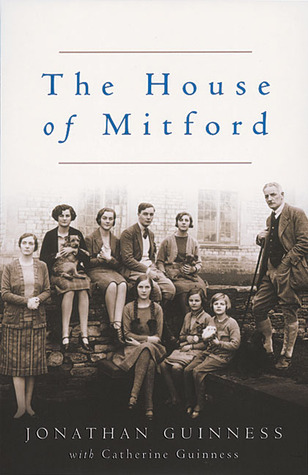 The most famous/infamous generation of the Mitford family is that of WWII era. Of the Mitford daughters 2 were buddies w/Hitler and hard-core Nazis, 1 a Communist, 1 a popular writer, 1 a sheep farmer and 1 a Duchess. The book successfully shows that despite all the family disagreements and bickering, underlying it all was strong family affection and unity. The book didn’t do much, however, to answer my initial questions about how an admittedly eccentric but not very political upbringing could produce such extremes of personalities and beliefs in a single generation. The early parts of the book on the Various Mitford ancestors interested me most but I bogged down as we neared the twentieth century and just didn't get beyond Sydney and David's wedding. May be I will come back to it, but there is so much on my 'want to read list' that I will turn my attention there rather than persist. Loved this book! It was a well-researched and thorough recounting of a most fascinating family. However, since Jonathan is Diana's son, I wish he 1) would have offered more personal insights and 2) wouldn't have referred to himself in the third person. These are minor complaints, though, and the book was well written and intriguing. I skimmed passages of this book which seems so outdated in light of other books I have read. The prose is unnecessarily thick and pedantic. Not a good casual read. I'm pulling out of this one and starting to read the Mitford Letters book. This a good read, far more informative than Lovells, but that could be its down fall. It's very detailed and takes a while to get to the point. If you are a Mitford buff, it's definitely worth reading. A must for anyone who is in love with the Mitford family. It provides a detailed history of the entire family and it serves as a great reference book in later years as you forget some of the details of the family. More Mitfords. More details. More Madness. Awfully boring book for such interesting subjects. Yawn.